As close as it gets … this is always such a great show and very busy as well! THE GUNS N ROSES EXPERIENCE have the only singer able to deliver the exact same unique vocal style and stage show synonymous with classic Axl Rose. And the only tribute band guitarist OFFICIALLY ENDORSED by MARSHALL AMPS, decease just like the legend SLASH himself. And together with four other Guns n Roses clones, these guys deliver a sound and look that is unequalled. Since their very first gig the Guns N’ Roses Experience train has been rolling at an incredible pace, visiting various Middle Eastern countries, mainland Europe, Cyprus, Ireland and all of the major venues and theatres in the UK. 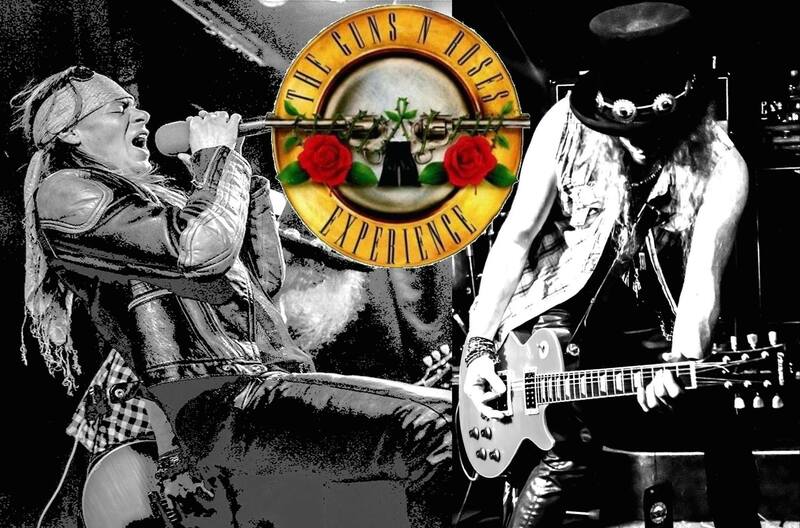 With a true Guns and Roses sound and stage show, The Guns N’ Roses Experience meticulously recreates every visual detail and every musical note to capture that reckless spirit of the original Guns’N Roses legendary live performances. In a bone crushing two hour set all the essentials are covered with breath-taking accuracy including Welcome To The Jungle, November Rain, Sweet Child O’Mine, Paradise City, Mr. Brownstone,You Could Be Mine, Night Train, Rocket Queen, Knocking on Heaven’s Door and so much more!